11165+ web files, a regularly updated Gazetteer, overall an in-depth description of our island's internally self-governing British Overseas Territory 900 miles north of the Caribbean, 600 miles east of North Carolina, USA. With accommodation options, airlines, airport, actors, actresses, aviation, banks, beaches, Bermuda Dollar, Bermuda Government, Bermuda-incorporated businesses and companies including insurers and reinsurers, Bermudians, books and publications, bridges and causeway, charities, churches, citizenship by Status, City of Hamilton, commerce, communities, credit cards, cruise ships, cuisine, currency, disability accessibility, Devonshire Parish, districts, Dockyard, economy, education, employers, employment, environment, executorships, fauna, ferries, flora, former military bases, forts, gardens, geography, getting around, golf, guest houses, history, historic properties, Hamilton, House of Assembly, housing, hotels, immigration, import duties, internet access, islands, laws, legal system, legislators, main roads, marriages, media, members of parliament, money, motor vehicles, municipalities, music and musicians, newcomers, newspaper, media, organizations, parks, parishes, Paget, Pembroke, performing artists, residents, pensions, political parties, postage stamps, public holidays, public transportation, railway trail, real estate, registries of aircraft and ships, religions, Royal Naval Dockyard, Sandys, senior citizens, Smith's, Somerset Village, Southampton, St. David's Island, St George's, Spanish Point, Spittal Pond, sports, taxes, telecommunications, time zone, traditions, tourism, Town of St. George, Tucker's Town, utilities, water sports, Warwick, weather, wildlife, work permits. See by name in St. George's Parish. This web site shows all those in Bermuda. On August 14, 1775 many barrels of gunpowder were stolen from the original Gunpowder Cavern at the British garrison near this site by Bermudian sympathizers of the American Revolutionary War. They were rolled secretly by night by Bermudian sympathizers of the down the hill to nearby Tobacco Bay and rowed to an American ship manned by men some of whom later became US Marines, in one of the first actions of the Continental Navy, before the establishment from the latter of the UN Navy. Unfortunately, the Gunpowder Cavern, a magnificent and unique structure that is believed to have been connected by a secret tunnel to all of the British Army forts in St. George's, built by Royal Engineers and Sappers in 1887 near where the Gunpowder Plot occurred, again to store British Army gunpowder but this time much more securely than earlier, is no longer open to visitors. In the 1960s, after long lying deserted, it became a combined restaurant and tourist attraction, especially popular with with both civilian visitors and American military personnel and their families then stationed in Bermuda who wanted an atmospheric night out. The facility once had and displayed the historic battle flags of both American and British units who served in Bermuda. It closed again in the 1990s and has not been re-opened since. Bermuda Gunpowder Plot of 1775, from a 1995 Bermuda Postage stamp. 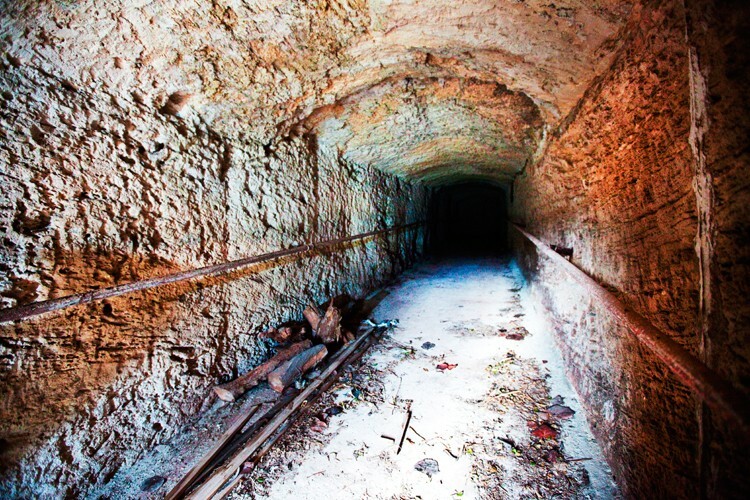 Also see the photo, below, of the long-closed Gunpowder Cavern. The historic, 2-storey, 4,500 square feet, former Queen's Warehouse building by the Penno's Wharf Cruise Ship Terminal. This was earmarked with the help of overseas expert Bill Pfeifer, the director for interpretive programs, staff development and visitor services for the Colonial Williamsburg Foundation in Virginia, and design consultant Ed Bronwikonski, Jr. who had earlier designed the award-winning North Rock Exhibit at the Bermuda Aquarium. An initiative begun in 1993 by the Bermuda Chamber of Commerce. Seasonal, usually May to early fall. With free local entertainment. Locals and visitors can shop at many stores with special late closing hours (7:00 pm to 10 pm), eat and listen to island culture. The hub of life in the town. 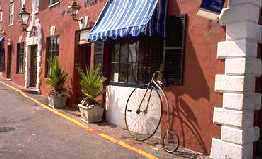 Nearby are prime town attractions, shops, restaurants, historic artifacts and municipal offices. At various times, it was also known as King's Parade and Market Square. This small park is on the right side of Ordnance Island as you face it. 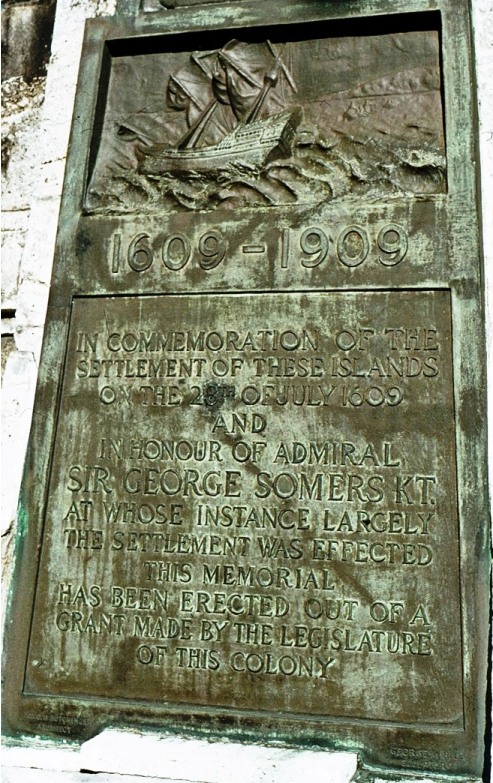 It includes the the Desmond Hale Fountain statue of Sir George Somers, unveiled by the late Princess Margaret in 1984, during the 375th anniversary of the Sea Venture shipwreck in 1609. The park itself was unveiled on April 20, 1997 during the Twinning Ceremonies with Lyme Regis, with a Scottish Piper in attendance. Major Burns, originally from Scotland in the United Kingdom but Bermudian by status and domicile, was the Town Crier from 1964 to 1994 and a very popular figure for many years. 2018. November 21. A plan to launch a marina development in St George could become a reality soon. The Government’s Throne Speech suggested that legislation to get the project under way would come in this session of Parliament. Mark Soares, of Bermuda Yacht Services, is happy the marina project was included in the Throne Speech. Mr Soares said he had been told work was under way to prepare the needed legal changes, but was not aware of a time frame. He added: “From my conversations with the permanent secretary, I know that they are working on it. They are still keen for it to happen. What happened was the changes that were made to the Municipalities Act had affected things. The corporations weren’t allowed to offer long leases any more and now everything has to go through Cabinet.” Mr Soares said that even though the marina had missed last year’s America’s Cup, the marina would still be a success. He explained: “I don’t think it’s too late for it. We have seen increased numbers of yacht visits and the yachts staying longer in Bermuda. When we have more facilities, it makes Bermuda appear like more of a destination. I’m still actively promoting Bermuda as a yachting destination. There’s also the possibility of more changes in the legislation to encourage yacht visitors to come here and stay here longer.” The Throne Speech, delivered this month, promised that MPs will be “invited to consider” a Bill to allow construction of the marina to start. Quinell Francis, the Mayor of St George, was pleased the marina was included in the Government’s blueprint for the parliamentary year. She added: “We look forward to consultation, drafting, tabling and approving of the necessary legislation for the marina so we can then move forward the long-awaited marina for the Town of St George.” Glenn Jones, director of strategy and corporate communications for the Bermuda Tourism Authority, said the marina would help to bring yachts and superyachts to the Unesco World Heritage destination. He added: “We would consider the marina an important piece in a wider policy strategy that makes Bermuda more competitive versus other nautical tourism destinations and more attractive to sailing events managers and yacht owners. 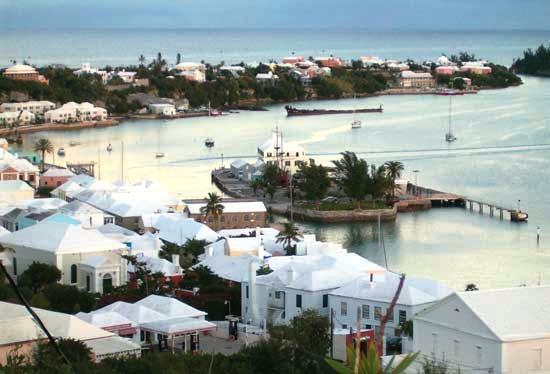 We continue to work productively with the Government on many of these issues because we know they will be beneficial to our tourism industry, particularly small business owners throughout Bermuda’s economy.” The Corporation of St George has tried to have a marina built at Ordnance Island for more than eight years. But progress was slow, despite backing from both Progressive Labour Party and One Bermuda Alliance governments. A “final agreement” between developers and the corporation for a marina was signed in 2015. Legal amendments to give breaks on duty on construction materials for the marina were approved by the House of Assembly the following year. 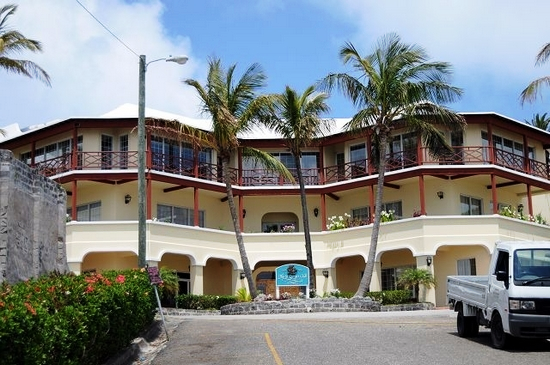 The Corporation of St George announced a plan to develop both a marina and a 60-room boutique hotel in the town in 2010. The hotel proposal was put on the back burner in 2012 because of finance problems, but the marina proposal was continued. Another famous old town street, named for once being the place where many 17th century seamstresses operated en masse, almost like a union. Broad Alley, behind St. Peter's Church. A restored 18th century 2-bedroom parsonage, an immaculate cottage with black shutters and with its exterior similar to an English country garden except that lime, loquat and spice trees abound. Note the similarities to many buildings in the more historic parts of Virginia, built in the same period. With typical welcoming arms architecturally. One of Bermuda's earliest homes. Originally built in or before 1699 and lived in by a notorious buccaneer whose exploits included buying and selling Bermuda-built cedar ships for the Royal Navy. His widow inherited the property. Once the residence of the Rev. Alexander Richardson, rector of St. Peter's, thus the name. He died in 1805. In 1903, owned by Robert H. James whose heirs sold it in 1950 to the Bermuda Historical Monuments Trust, now the Bermuda National Trust. It leases the property. In September 2015 it advertised it for rent at $2,850 a month. A major Bermuda landmark. On Princess Street, this property (photo by author Keith A. Forbes) is administered by the Old State House Preservation Society (see below). It was constructed in 1621 specifically to serve more appropriately (instead of at St. Peter's Church as before, from 1620) as the meeting place of local parliamentarians. It later became a Freemasons Lodge but is open to the public. It was the first stone-built civilian property in Bermuda and one of the oldest standing stone structures erected by English colonists in the New World. It was built by Governor Nathaniel Butler, constructed nine years after the first stone-built military property in Bermuda, Paget Fort on Castle Island. Its design was perhaps influenced by the Italianate style introduced to England by Inigo Jones from about 1610. Except that an Italian flat roof proved to be completely the wrong idea for Bermuda's porous native limestone building material. Various changes had to be made from a flat roof to a hip roof. It was rebuilt yet again, this time with a flat roof once more, from the level of its downstairs windows in 1969 using John Smith's engraving as evidence and with technical overseas assistance. Its flat roof is not original, a reconstruction of the original flat roof from Gunpowder was stored in this building for more than a century and a half, until 1767. During the American Revolution, British troops from New York and South Carolina were quartered here from September to December 1780. From the time of Governor Butler until the capital of Bermuda was moved to Hamilton in 1815, it was also referred to as the Sessions House - as the seat of the local parliament and Courthouse, where legal justice was dispensed. Today, it is leased by the Government of Bermuda to the prominent Masonic Lodge St. George No. 200 of the Grand Lodge of Scotland, for the annual rent of one peppercorn. 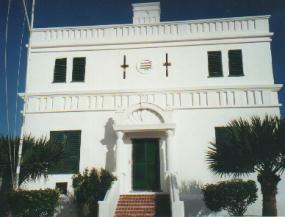 The Old State House Preservation Society is a registered Bermuda charity, number 576, to help maintain the Old State House. It consists of about 30 concerned citizens locally and about six former citizens of Bermuda, now overseas, who wish to assist. Phone 296-6185. A seasonal weekly Sunday 2 pm to 6pm event involving a variety of retailers selling from a central street location. A residential street with, like so many others in the old town, a distinctly British name. It was named during the American Revolution when Governor Bruere, a former British Army soldier whose two sons were fighting in the British Army in America, placed a gun platform in the alley after the pro-American Gunpowder Plot of 1775 in Bermuda. Completed in late October 2002 were many improvements including laying of attractive brick paving, period lighting and more as part of the Town Heritage Plan. The only island in the old town, this one is 1.75 acres (7,100m2) and man-made. There were once several islands here. The present island, the only one in the town, is lies close to the shore opposite the town square (King's Square) and incorporates via reclaimed land what once were Ducking Stool, Frazer's and Gallows islands, all once used for executions by hanging after being convicted of witchcraft or capital crimes. One also stored munitions for the British Army and Royal Navy. They were joined together in stages by the mid 19th century on the order of the British Army, which then had a very considerable presence in Bermuda including in this town and nearby and was very concerned about a potential threat, mostly from the USA. The combined new island took the name "Ordnance" from the fact that it became the British Army's Royal Army Ordnance Corps (RAOC) main Bermuda depot and British Army receiving port for packet ships mostly from Britain, serving the garrison in this town, the large new Prospect garrison in Devonshire Parish then under construction and the eventual sweeping acquisition by the army of large chunks of that parish for military fortifications including forts and batteries, logistical, supply and related purposes. (The RAOC also operated from another, smaller, depot from a wharf on East Broadway on the outskirts of the city of Hamilton 12 miles west of this town). 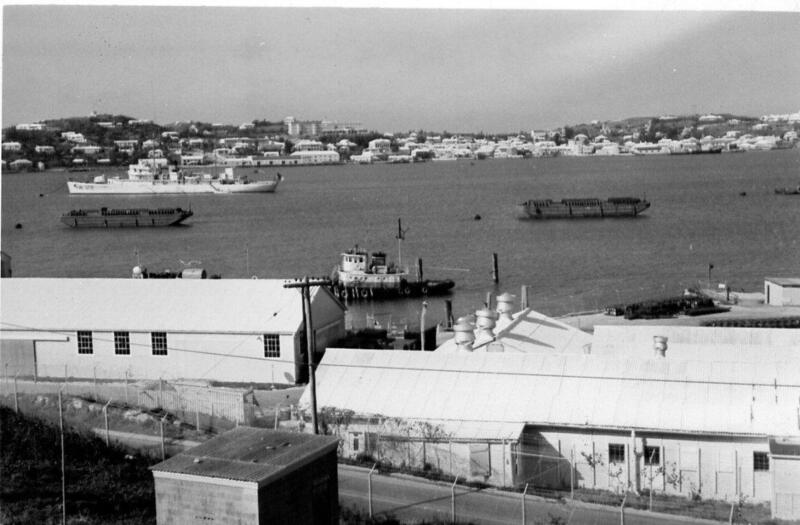 By the Second World War, because the RAOC depot was no longer being used and United States military forces had been stationed in Bermuda and were building two big military bases in Bermuda, one across the harbor on St. David's Island and the other in Southampton Parish, it became a United States Navy anti-submarine base (1942 to 1945). The channel between Ordnance Island and the King's Square was not bridged until after the Second World War, by the US Navy. Before that, it was a wooden bridge. In 1962 the island was visible as a location in the 1962 film That Touch of Mink, with Cary Grant and Doris Day. All the principal buildings once erected by the British Army and US Navy have long gone. One large Army building, the Storekeeper's House, was later refurbished as offices for the Corporation of St. George. The only other buildings on the island are an office of Bermuda's HM Customs used to clear visiting yachts, and a new cruise ship terminal. There is, however, a prominent replica of the Deliverance located on the island. The original was one of the two ships built by the survivors of the Sea Venture, flagship of the Virginia Company, which was wrecked in Bermuda in 1609, accidentally beginning Bermuda's settlement. Several of the most prominent attractions of the town are located here or nearby. Ordnance Island was the starting and finishing point of Dodge D. Morgan's record-breaking 1985-1986 non-stop, solo circumnavigation of the planet aboard the American Promise. Today, the island has a small park for choice views, a statue of Admiral Sir George Somers who founded the town in 1609, one of the two cruise ship berths and a former government building, "Tabernius House," tastefully renovated with spacious and unique 2-bedroom condominium suites with waterfront and views across St. George's Harbor. 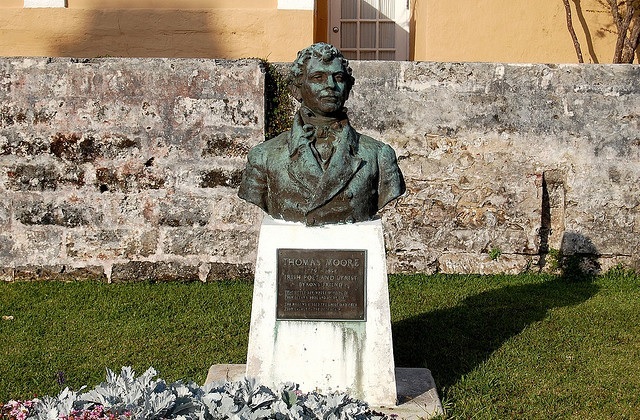 The Major Donald H. (Bob) Burns Memorial Park on the island includes the Desmond Hale Fountain statue of Admiral Sir George Somers (credited as the founder of Bermuda, and at the helm of the Sea Venture when she was driven on the reefs) which was unveiled by the late Princess Margaret, Countess of Snowdon in 1984, during the 375th anniversary of the shipwrecking. The Memorial Park was unveiled on April 20, 1997 during the Twinning Ceremonies with Lyme Regis. She was the smaller of the two Bermuda built vessels Admiral Sir George Somers commanded when he and his party set sail for Virginia in 1610, with 142 castaways, after 42 weeks in Bermuda. When the colonists finally arrived in Jamestown, Virginia, ten or so days later, they brought with them enough food to buy some time for the Colony of Virginia, then with only about 60 souls remaining from the original two expeditions and those who had come ashore in 1609 as survivors of the seven other ships of the Third Relief Supply fleet also commanded by the Admiral. She brought the Admiral back to Bermuda in 1610 but he died here. 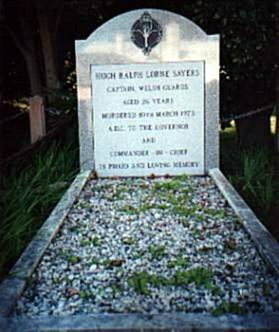 His heart remained here but his body was returned to Lyme Regis in England on the Patience. Alas, she was never seen in Bermuda again. There is no replica of her in Bermuda. Built in the town in 1858. This wharf was constructed by and named for onetime Royal Army Ordnance Corps captain William Lanyon Penno, originally from Cornwall, England. Penno had arrived earlier in Bermuda as part of a military plan to heavily fortify Bermuda, as a British island in the American geographic and geo-political region, from possible American attack after numerous recorded American spies sent to Bermuda were caught in the 1840s to 1860s. St. George's was then an active British Army base. Penno was one of those who initially created then lived with his wife Jane whom he married in 1843, on Ordnance Island in the town, for the ordnance activities of the British Army. An ambitious man, he saw the potential of the land he purchased, on which he built his wharf. He became so rich after his wharf was used countless times during the US Civil War by Confederate ships sailing from Britain via Bermuda with military and other supplies to southern US ports that he, his wife and family were later able to relocate to Britain in great comfort. He later headed ordnance for a major British military base and became a British Army Major General and head of Ordnance. On a morning in every late April, see this civic and military ceremony, believed to be unique to Bermuda and Britain. It takes place on King's Square and costs thousands of dollars to mount a full fledged parade and ceremony to collect a rent of great historic but no monetary value. With much pomp, circumstance and military precision, the Governor, on behalf of the Government of Bermuda, accepts from the Lodge which has occupied the State house as its headquarters since 1815 the annual rent of one peppercorn. Lodge officials, the Governor and the town Mayor are in their full costumed regalia as this payment is formally demanded by the Government and promptly rendered. Peppercorn rents were customary British rents from the 17th century onwards. They are symbolic, ensuring there was some form of rent to be paid; that a tenant had certain obligations to a landlord. No longer serving the Queen as a Bermuda Customs warehouse but still named this. Now a world-class visitor centre for the St. George's Foundation, for a symbolic lease of a small bale of cotton. It is the $20 million cornerstone of St. George's as one of the more than 812 World Heritage properties in 125 countries on the UNESCO list. King Street. It stands in front of the State House. It was one of four buildings acquired by the Bermuda National Trust (BNT) to protect the facade of this very significant historic property. A residential building with interesting gardens representative of early colonial plantings. The small gardens are open to visitors. Also now the repository of the BNT's 500,000-piece collection of archaeological artifacts mostly from the town. The building underwent a US $350,000 restoration in 1998, with a $100,000 donation from a leading locally based insurance company. It is a three floor building originally started in 1705 and completed in 1706 by the English minister of St. Peter's Church, the Reverend Thomas Holland. Extensions to the north and northwest were added in the late 18th or early 19th century. It got its present name from an English shipping merchant, Thomas Reeve, who married Elizabeth Tucker from this town in 1781. For centuries, it was the tallest building in the town. The Sunday before Remembrance Day, a Public Holiday. The Royal Artillery Association Bermuda Branch has an annual Remembrance Sunday Wreath Laying Ceremony, Parade and Church Service on King's Square - near the war memorial - and St. Peter's Church, led by the Band of the Bermuda Regiment, on the day before Remembrance Day. Decorations and medals are worn. Water Street. Telephone (441) 292 6157. With its Bermuda Lodge Heritage Museum, it focuses on local black history. Its permanent collection features the works of local Friendly Societies and Lodges which originated in England, Ireland and Scotland to offer practical help to working class white people. They did the same for blacks in Bermuda and rose to prominence after Emancipation in 1834 when blacks had no property and could not legally earn money until they were freed. Societies pooled funds and redistributed them among the needy, especially after development in the 19th century of trades and building up of this former military garrison town and concurrent development of the Royal Naval Dockyard in Sandys Parish. Areas covered include ship building that went on in Bermuda throughout the early to mid 1800's; the piloting skills; and the training in marine related industries given to artisans and craftsmen. Practically every local black family of the period had a member who was a member or beneficiary of one of the Friendly Societies. They introduced gift clubs, bank savings and other forms of self help to many individuals. They were formed by people who were sometimes illiterate themselves, yet helped others to find dignity, a little accumulated money and job satisfaction. 2016. September 13. Thousands of gallons of raw sewage from St George is still being dumped out at sea every day with no fixed timeline for improvements, The Royal Gazette can reveal. The Ministry of the Environment told this newspaper, in response to questions, that about 35,000 gallons of untreated sewage was discharged daily from a municipal outfall on North Shore which serves the town of St George. The wastewater disposal does not appear to have affected the quality of the bathing water this summer at Tobacco Bay, a popular beach for tourists and locals close to the old town, according to routine testing done on seawater samples taken by the Department of Health. Results posted online by the Department from May 1 to August 14 show levels of enterococci — a group of bacteria used as an indicator of pollution or faecal contaminants — far below the maximum accepted levels recommended by the Environmental Protection Agency in the United States. But St George’s North MP Kenneth Bascome, who promised that something would be done about the raw sewage when he ran for Parliament in 2012, has admitted the problem was “unacceptable” and must be fixed. “You have to be aware that that is a not easily fixable situation,” the One Bermuda Alliance politician said. “At this stage, that’s an ongoing process. I would say there are many folks in town that are not really aware. There have been some improvements but the fact that the raw sewage is still being pumped, it’s unacceptable.” This newspaper asked the Ministry of the Environment to reveal how much untreated waste per day was being released into Bermuda’s waters, in the wake of the latest “sewage balls” to wash up on Grape Bay last month. A spokeswoman said that as well as the 35,000 gallons of untreated sewage from St George, another 600,000 gallons of treated wastewater was discharged daily into the sea from the Seabright municipal outfall, just west of Hungry Bay, which serves the greater Hamilton area. About a sixth of that — some 100,000 gallons — comes from King Edward VII Memorial Hospital and is, according to the spokeswoman, “treated to the highest, or tertiary, level”. The remaining 500,000 or so gallons from the Hamilton sewerage system goes through preliminary treatment; it is “filtered through 3mm pore screens” to remove grease and solids, following an upgrade on the Front Street waste water plant in summer 2015. The spokeswoman said: “There is a plan proposing additional treatment to improve the quality of effluent at both outfalls, though timelines are not fixed. A full range of options is under consideration.” The Ministry of Public Works has commissioned a Canadian consultancy firm, Associated Engineering (International) Ltd, to conduct a $225,000 study into how to improve the water system in the parish of St George’s, including dealing with sewage. Their report is due by March next year. St George town manager Candy-Lee Foggo said the Corporation of St George was responsible for the sewage from the Olde towne and was awaiting the outcome of that study before deciding how to proceed. “It doesn’t make sense to replicate efforts,” she said. “We are a part of the parish. For us to go and do a separate study, it’s not a good use of our very finite resources.” Ms Foggo said Southside already had a sewage treatment plant, as did the airport, and one possibility was to “bring all the systems together. It’s got to be a holistic approach and then come up with a solution. Any new or improved sewage treatment facility for St George would not pay for itself and how to fund it would need to form a key part of the consultants’ report, along with who will build it, who will manage it”. In the meantime, the municipality is encouraging restaurants in St George to comply with a new law passed in the House of Assembly last month requiring them to fit grease traps, to reduce fats, oils and grease in the island’s waste stream. “They are moving in the right direction,” Ms Foggo said. “We don’t have 100 per cent compliance yet.” Mr Bascome pledged in October 2012 that under an OBA government: “We will no longer be pumping raw sewage into the ocean.” He said yesterday the government had commissioned the parish study but responsibility for the town’s sewage lay with the Corporation of St George. “It’s my hope that before the next general election, something concrete will be done,” said Mr Bascome. An historical, tiny but rewarding street that gives visitors a unique time-span experience of architectural and botanical Bermudiana. On the street are Stuart Hall, a building with a rich history, rented by prominent local individuals since 1700, and with archaeological digs revealing a gravesite with human remains from the 1600s. Now the vaulted cedar-beamed building houses The Bermuda Perfumery, where visitors can learn about fragrances made from Bermudian flowers. 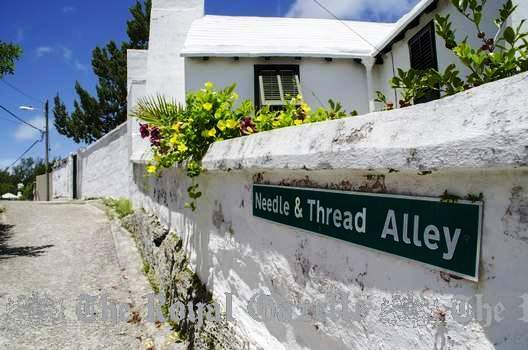 The alley meanders down, past Pilot Darrell’s house, one of the first houses to be owned by a black Bermudian. Crossing the main York Street, visitors can find a walled garden built into the side of the road. This shady patch abounds with ferns and deep green broad-leafed plants, nice to see or to take a light lunch. The Alley opens out onto Water Street, the bustling, picturesque main street of St. George for retailers. Right next to Silk Alley entrance, visitors will enjoy browsing the cozy, low-ceilinged Book Cellar’s extensive collection. Charming hotel, condominium and cottage complex overlooking the town. The club house property and time share units were built on the site of the famous St. George's Hotel which in a previous era had an illustrious career. 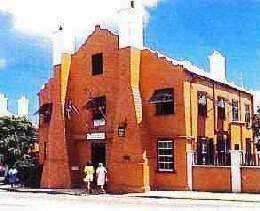 It was once the choice place to stay for many artists who came to Bermuda to paint the Old Town in the early 20th century. (See Artists who Painted Bermuda). The lovely old St. George's Hotel, no longer there, seen in top right of this small historic photo, replaced by the nice St. George's Club. 24 Cut Road, phone 297-1612. Water Street and King Street, St. George's. Serves residents and visitors on the ferry service between Hamilton and this town. 5 Queen Street, GE 05. P. O. Box GE 58. Telephone (441) 297-8043. Fax (441) 297-2479. E-mail stgeofoundation@ibl.bm. Bermuda registered charity 454. 1 Park Road, St. George's GE 03. North of and near Town of St. George. Not on bus route. Phones: Office 297-8067 (fax 297-2273); Pro Shop 297-8353; Golf Pro 297-3660; Tee Times 234-4653; Maintenance 297-8370; Restaurant/Bar 297-1836. An 80 acres scenic 18 hole par 62 course over 4,043 yards, first opened in 1985. Cruise ships pass by. Extensively renovated in most of 2006. For visitors who arrive at the airport on one of the commercial airlines or cruise ships, the closest cruise ship berth is the Town of St. George, about 2 miles away to the south. 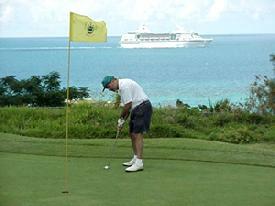 Many cruise ship visitors play this course. Buses (# 1 or 3 or 10 or 11) go part of the way. Check rates directly with course depending on time of day and time of year. This was one of the last designed by Robert Trent Jones Senior prior to his retirement. The 18th hole is named after Bermuda's first Governor, Richard Moore. One of the greens overlooks historic Fort St. Catherine. Re-opened in part in May 2011 after being closed since July 2008 because (a) it was losing money for the Bermuda Government which owns the course and (b) to allow for building of the one-planned but since 2012 no longer viable new Park Hyatt hotel. The motivation for re-opening the course on a temporary basis is a joint venture with the Bermuda Chamber of Commerce, the St George’s Club and the government's Economic Empowerment Zone (EEZ). The course is maintained at a similar level to municipal courses in the UK, in the best interest of the Old Town and increase the latter's marketability to tourists. Some changes have been made to the course layout. The front desk area of the St George’s Club on Rose Hill now serves as the club house. Parking is at the tennis courts, with extra space at the old Oxford Laundry. Drinks and refreshments are available at Griffin’s Bistro and Bar and Blackbeard’s Hideout, by St Catherine’s Fort. No longer applicable but until 2012 it was intended by Government that once the new hotel was built, the course would be run (although still owned by the government) by the new hotel. The long-term re-development plans for the course included an extensive enlargement to 6,000 yards and redesign by top British golf professional and winner of six Major tournaments Nick Faldo, by his corporation Faldo Design. The Park Hyatt (St. George's) Resort Act 2008, (revoked in 2012 by the government for non-compliance with the agreed terms after several extensions) would have removed the course from the Golf Courses (Consolidation) Act 1998 under which a single Board of Trustees manages the publicly-owned courses at St. George's, Port Royal and Ocean View. But it had been stipulated that the developer had to ensure that the golf course remain accessible to the public during such times and on such reasonable terms and conditions as shall be approved by the government. Scenic waterfront, looking clear over to St. David's. The harbour has docks for cruise ships, marinas and anchorages. Modern vessels must pass through an area of wrecked ship and deadly reefs. In the first half of the 10th century, it also housed prison hulks, as the second graphic below shows. They included American prisoners-of-war during the war of 1812-14. This view from Gleason's Pictorial Drawing Room Companion. 1918. En route to the USA from Britain with a cargo of Dover chalk, the three-masted, steel-hulled, 236 foot vessel Taifun, built in Greenock, Scotland in 1894, was badly damaged at sea in a bad storm. She was stranded there for 3 years and in February 1921 was further damaged by a steamer in the harbour. She was left to decay. 1919. The American four-masted auxiliary schooner NE Turner, quite new when disabled off Bermuda and towed here where she remains. Mitchell House, 3 Featherbed Alley. Telephone (441) 297-0423. Bermuda registered charity 478. Since 1920. 18th century house filled with antique furniture and paintings. This was once a typical Bermuda dwelling. Built circa 1725, the unusual "welcoming arms" entrance is a distinctive feature of Bermudian architecture. In the high season from April to 15 November, It is open Monday to Friday 11 am to 4 pm. There is an entrance fee per visitor and an annual membership fee for residents and interested overseas persons. Bermudian historical artifacts including reminders of Bermuda's roles in the American Revolutionary, 1812-14 and Civil Wars, cedar work, documents. There is also a working replica of a Gutenburg printing press (brought to Bermuda in 1784 to print the colony's first newspaper). It was first invented in Germany in the late 1400's and refined slightly in the 1500's. It remained popular for printing of broadsheets for well over 300 years. Market Nights every Tuesday night 7 pm to 10 pm from April 30 to November 30 in King's Square. A traditional Bermuda market with stalls featuring locally made arts and crafts, market produce, music and sale of baked goods. Gombeys perform. Cruise ship passengers can join other visitors and residents. It goes to some of the places within St. George's Parish that the regular buses don't visit. Details from Visitors Service Bureau. Of historical interest, chiefly as a prison in the 1770s-1780s. During the USA's War of Independence, American prisoners-of-war were confined here. In September, 1780, Bermuda suffered from a terrible epidemic that began with the Americans in this prison and spread quickly throughout Bermuda. The prisoners died. Because of a shortage of food island-wide caused by the war, resistance to the disease was low. This primary school celebrated its 140th anniversary on January 8 2016 with a special assembly announced by David Frith, the Town Crier and former chairman of the board of trustees. “The Prep” is now the highest ranked public school in the Cambridge Checkpoint examinations. The school opened on January 10, 1876, as a one-room schoolhouse in the former Sunday school of the Ebenezer Methodist Church. Known simply as “the school” in those days, it was officially recognised by the Ministry of Education in 1880 and renamed the St George’s Grammar School. The present school was built in 1923, as a community effort; it stopped taking senior students in 1966 when it became known as the St George’s Preparatory School. The school has strong family ties. The Spurling family have kept an “unbroken line” as trustees of the school since the beginning, with Ann Spurling now sitting on the board. Devastation was wreaked upon the campus by Hurricane Fabian in 2003. The school was partially destroyed and was repaired using insurance money and donations. Under the Town of St. George (Protection of Buildings of Special Interest) Act 1950, Bermuda Government appointees are shown under this name in Bermuda Government Boards. Duke of York Street. Phone 297-2549. In many ways the religious, spiritual and cultural icon of Bermuda. In 2012, its 400th anniversary year, Queen Elizabeth II honored St Peter's with the unique title: 'Their Majesties Chappell', a term first used in the late 1600's during the reign of King William and Queen Mary. This church was once on part of a sea inlet. Claimed as the oldest continually occupied Anglican church in the Western Hemisphere. Governor Moore constructed the original church before Christmas, 1612. Whether exactly on the site of the present church is not known, but due to negligence of the workmen in charge, but mostly because the church was located on an bleak, exposed hill, a gale tipped over the timber-framed structure. The Governor then, from the ruins of the wooden church, constructed a very fine house built in the shape of a cross", which served the faithful and may also have been used for the first Court of General Assize in 1616. That second church lasted but four years, at which time in early January 1620, the energetic Governor Butler built a new one: it was there that the first Assembly was held on August 1, 1620. 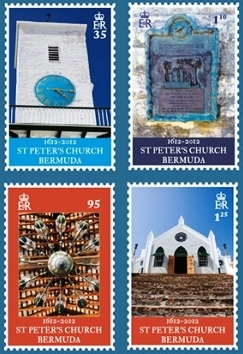 Graphic above right - Bermuda postage stamps of October 18, 2012 depicting St. Peter's Church. In September 1712, the church was demolished by a hurricane and the "parishioners rallied round to make a new stone building" in 1713 which was to be a cruciform with a "southern extension with a welcoming-arms porch and steps". In 1815, under the "moving spirit" of John Till, the church was extensively enlarged. The original Jacobean communion table (the oldest piece of Bermudian cedar woodwork), the unusual three deck pulpit and other fittings salvaged. A large number of the original timbers were also incorporated. Gravestones in the way of that development were tossed aside or buried; walls built over graves contributed to the perilous state of the building by the 1950s. In 1841, the southern extension was lengthened for a new main entrance. In the early 1950s, the church was much rebuilt and at that time, "the most spectacular find was the old original 'welcoming' bricked steps" of the 1700s, and a number of headstones which had been "buried" under the main entrance when it was extended in 1841. The church’s oldest bible is dated 1594 and the earliest communion ware is the St. George’s Chalice given to the church by the Bermuda Company in 1625, in the reign of Charles I. Another set was given to the church by William III in 1697. The Bishop’s throne dates from the 18th century. With the flag of St. George waving over the town from its tower, St. Peter’s has been at the heart of the community for almost four hundred years. Generations of townspeople have looked to its clock for the time of day and its bell has called the people of the parish to worship. It has also announced other important events such as the declaration of the emancipation of slaves on August 1, 1834. 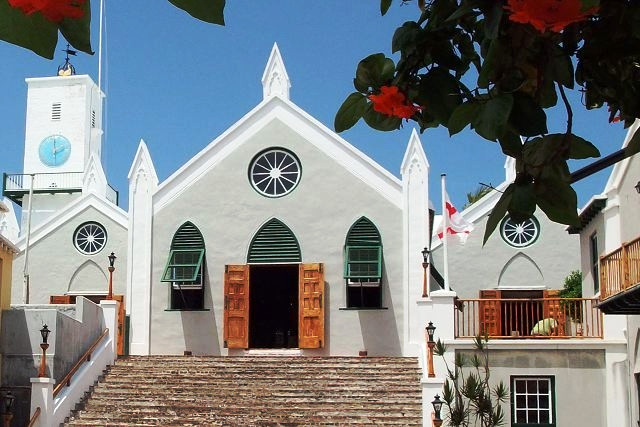 The church was also the meeting place of the first Parliament of Bermuda, held August 1, 1620 and has continued to be a special place of important community events such as the annual Remembrance Sunday Service. The church has many unique military memorials from when it was a British Army garrison town, mostly from or about soldiers who died in Bermuda from yellow fever earlier or in the mid to late 1800s. The valuable and unique communion plate and related items are tangible reminders of Bermuda's history. In August 2008 the remains of three men were found under the floorboards of the church. They were buried in haste. 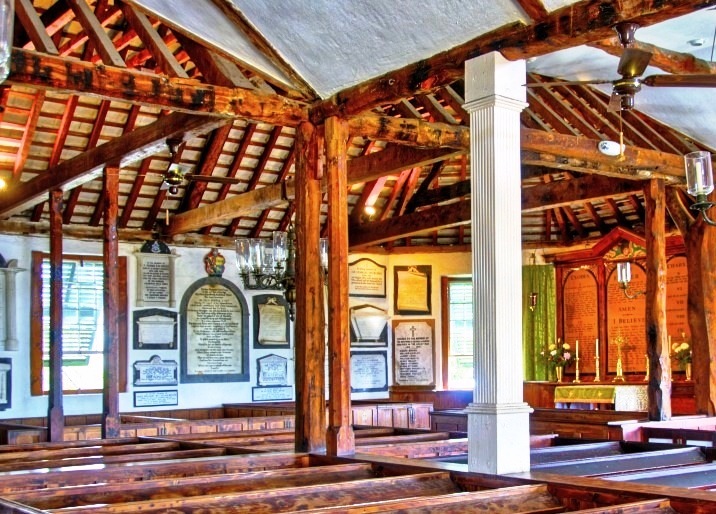 One was the skeletal remains of the man who was Governor of Bermuda during a significant moment in history, found after lying forgotten for 228 years beneath the floorboards of this church. The wood coffin that once encased Governor George James Bruere had disintegrated with the passing of the centuries, but a copper name plate inscribed with his details and date of death, September 10, 1780 at the age of 59, originally attached to the top of his coffin was found resting in the chest cavity of his skeleton by archaeologists crawling through a tiny two-foot gap beneath the church floor. It is believed he died of Yellow Fever, which is why he was placed under the church, not in the graveyard. Bruere was in charge of Bermuda at the time of the infamous gunpowder plot during the American Revolutionary War, when a stash of gunpowder was plundered from the Island and then used to devastating effect against the British forces. Bruere, a former British Army Lieutenant Colonel who lost a son also in the army fighting the Americans, was outraged when he discovered what had happened and put up a reward for the capture of the Bermudians responsible but to no avail. Bruere was Governor from 1764 until his death on September 10, 1780. His portrait hangs in the Bermuda National Trust's Tucker House museum in the heart of St. George's. Another skeleton found there, also buried in haste for the same reason, was Sir Jacob Wheate, a British Navy captain and commander of HMS Cerberus - now a dive site also known as the 'Musket Ball Wreck'. The 5th Rate 32 gun ship was launched in 1779 but struck rocks in Castle Harbour and sank in 1783. A team of archaeologists at St. Peter's Church found a coffin plate next to the corpse, inscribed with Sir Jacob's name and the words 'Commander of his Majesty's ship Cerberus'. Historical records suggest Sir Jacob died in 1783 of yellow fever. He should have had a more substantial burial, but it is thought they may have buried him quickly because he had yellow fever. It is hoped to re-intern Governor Bruere and Sir Jacob in the grounds of St. Peter's Church in a ceremony officiated by the present rector. The other corpse has been discovered slightly to the south, on top of the limestone bedrock. Traces of a coffin and coffin nails were found, plus small copper pins which suggest the man was wrapped in a shroud, the fibers of which would have disintegrated over the centuries. His identity is not yet known. The surrounding historic graveyard is the last resting place for many generations of gentry and commoners, governors and slaves, privateers and statesmen of Bermudian, British and American birth. Inside the Church the walls are covered with memorials to many men and women significant in the history of Bermuda and Western Atlantic settlement. 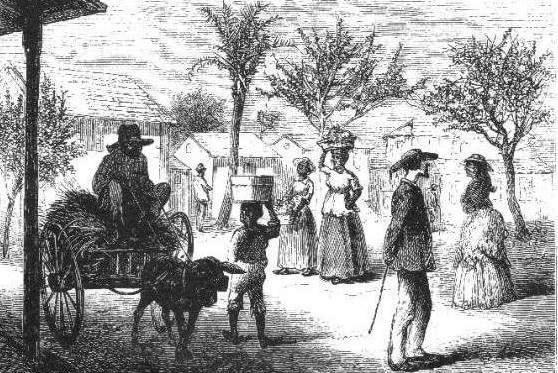 Slaves and former slaves were freed when the British declared slavery illegal in the early 1800s. Those reposing in their eternal rest in the graveyard to the right of the church include American midshipman, Richard Dale, mortally wounded in the 1812-14 War. In gratitude, his parents inscribed the headstone. Dale died when, in 1815, on January 15. "HMS Endymion" (Capt. Hope), the "Pomona", and the "Tenedos" both at sea off the city of New York engaged the US Navy warship USS "President" - one of the US Navy's six great frigates - forcing the latter's surrender. The "President", Capt Stephen Decatur, was brought to Murray's Anchorage, Bermuda. For a fuller account of the action see http://1812privateers.org/NAVAL/president.html. During the action, Midshipman Richard Sutherland Dale, Jr, of the President, oldest son of Commodore Richard Dale (1756-1826) from Philadelphia, was shot by a British marksman and had to have his leg amputated. As a severely wounded prisoner-of-war he was brought by litter with his colleagues to St. George's but five weeks later he died on February 15 from his wounds and was buried here at St. Peter's Church. He was 20 years old when he lost his leg after his ship President engaged the British warships above in the 1815 war between Britain and the US. He was brought to St. George's for treatment and cared for in Stennet's Hotel where the Bank of Butterfield now sits in the Town Square. But he was never forgotten. After the conflict ended, his father, Commodore Richard Dale, who had once served as First Lieutenant to John Paul Jones, came in thanks rather than revenge, to show his gratitude to the people of St Georges, for the respect shown his son in life and in death. Commodore Dale arranged for a horizontal tombstone, which reads: To Commemorate the Gallant Deeds of the People of St Georges whose Generosity and tender sympathy prompted the kindest attention to him while living and honoured him when dead." From 1932, Bermuda-born Captain Scarritt Adams, US Navy, initially funded an almost yearly remembrance service involving relatives of Midshipman Dale. Grave of US Navy's Midshipman Dale, died 1815. Among the other formal military graves is that of an American patriot from Philadelphia, honored by the the Daughters of the American Revolution organization. She was Anne Willing Bingham, said to be the most beautiful woman of her time. On May 11, 1801 she was buried here. She was Anne Bingham, in her 37th year, born in 1764, daughter of Thomas Willing of Philadelphia. At the age of 16, she married Senator William Bingham, possibly the wealthiest man in America, owning at one time more than a million acres of the state of Maine. They spent some years in Europe and it was there that Anne contracted an illness, for which Bermuda was prescribed as a place of cure. Unfortunately, a cure was not to be had. Anne Willing Bingham's reputation and fame yet survives, for she is supposed to have been the model for the famous Draped Bust portrait on the obverse of the American silver dollars and other United States coinage between 1796 and 1804. The famous artist Gilbert Stuart is said to have made a portrait of Anne in 1785, when she was 21 years old. From that sketch, the "Miss Liberty" of the Draped Bust coins was probably created. In the lower graveyard to the right of the church are the graves - shown above and here - of Sir Richard Sharples, Governor of Bermuda and his aide-de-camp (ADC) at that time Captain Hugh Sayers, Welsh Guards, British Army. Both were assassinated on March 10, 1973 and buried here at the express wish of their families after being gunned down without warning in Bermuda in the grounds of Government House, Pembroke Parish, as they were taking a walk with a dog. It was only a few hours after the Governor and Captain Sayers had been visited by the Commanding Officer of the US Naval Station at St. David's. (He had been driven by Ed Falato, who served on the base from 1970-74). The Bermudian killer Erskine Durrant Burrows was hanged, after being found guilty not only of these murders but also Police Commissioner George Duckett in September 1972 and an armed robbery in April 1973. After the hanging at Casemates Prison on December 2, 1977 of Burrows and another killer Larry Winfield Tacklyn, dreadful revenge racial riots occured in Bermuda, with attacks on police stations and many injuries to policemen and others. World-wide publicity gave a terrible picture of Bermuda. Many from overseas swore never to go there, or go there again. It was claimed by the Bermuda and British Governments that the killer was a Black Power advocate. During the riots, a prolonged State of Emergency occured that included a call-up of the Bermuda Regiment. British Governors of Bermuda were advised to stop having aides from overseas and instead to have local ones. It is how the tradition started in the Bermuda Regiment. The widow of Sir Richard Sharples was subsequently made Baroness Pamela Sharples in 1973 by the British Government in London, to mark the honor, sympathy and respect the British Government had for Sir Richard and to show the outrage Britons felt over how the Queen's Representative in Bermuda was assassinated in the only British territory ever to have a Governor murdered in cold blood. 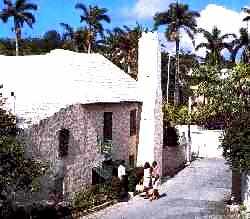 After a long absence because of the assassination, Baroness Sharples and her family bought a house in Bermuda. In 1999, perhaps fearing the repercussions of another riot - and under pressure from the British Government which objects to it - the Bermuda Government abolished the death penalty - unlike the USA which retains it. In 2005, the then-new organization Friends of St Peter's was formed under the patronage of the Duke of York. The first major undertaking of this organization was the refurbishing of the St Peter’s tower clock. Apparently it ceased working about 50 years ago and was subsequently dismantled and its inner parts stored somewhere within the church. The clock's face was taken and stored in an outbuilding at St Peter's rectory. The clock face was replaced with a replica, made of fibreglass. The remarkable thing is that most of the clock's parts, when found, were still largely intact, with only a few minor parts missing. The clock was originally purchased by John Till in 1815, but sometime in the mid-20th century it was damaged in a storm and then replaced by an electric clock with an electric bell. It is believed that the original clock was repaired by the same firm that actually made it in 1815, namely Thwaites and Reed, of Brighton, England. The tower itself, was built in 1814. St Peter’s has evolved over the centuries. The original church, a wood and thatch structure, lasted only a short while before being destroyed in a storm. This was replaced by a more substantial building and this is the one depicted in Captain Smith's illustration of 1624. Eventually the church was replaced by a stone structure, but with substantial amount of timber from the original building. Over the years since, various wings have also been added. The Victorian Gothic entrance that we see today, dates from 1841. Although we all refer to the parish church in St George's as St Peter’s, it has only been known by that name since 1826, when the church was consecrated by Bishop Inglis. Before that it was known as the St George's town church or more simply, the town church. In 2010 a new DVD was made of the church, by St. George's resident and filmmaker Lucinda Spurling and premiered at the World Heritage Centre at Penno's Wharf. Ms Spurling, of Afflare Films, was commissioned by the church to make the film to highlight its importance in Bermuda history. Her family have been members of the church for several generations. Her great grandfather Sir Stanley Spurling helped organize the upgrades in the 1950s. The film highlighted the fact that over the years the church building has had a number of purposes in addition to being a place of worship, including acting as a place for drying tobacco, and as a court room. Ms Spurling's 30-minute documentary features a number of experts on St. George's history including Michael Jarvis who wrote 'Bermuda's Architectural Heritage: St. George's' and most recently 'In The Eye of All Trades.' One of the things that is brought across in the movie is how special it is that the building not only still exists, but that it is still used for worship. The film also featured archaeologist Brent Fortenberry, Rev. David Raths the current vicar at the church and Chairman of the Friends of St. Peter's Rev. Erskine C. Simmons. Ms Spurling has also produced several other films including 'Rare Bird' (2006) and 'The Lion and the Mouse' (2009). 'The Lion and the Mouse' has won several awards including an Audience Award at the Bermuda International Film Festival 2010, A National Trust Awareness Award, and The Doreen Lightbourn/ Lionel Pearman Award. At international film festivals, it won The Golden Reel Award at the Nevada Film Festival, A Silver Remi Award at Worldfest Houston, and The Award of Excellence at Indie Fest. 'St. Peter's' the DVD, is available at the church office for $25. All proceeds from the sale of the DVD go to the church. For more information contact the church on 297-2459. On July 1, 2011, two priceless copies of the Bible, restored by St. Peter's at considerable cost and once owned by a Bermuda family, were put in display, behind bullet-proof glass. They can be seen. on application. 2012. February 15. Peter’s Church in St George’s prepared to celebrate a new jewel in its crown: the gift of an old royal title restored. The church is launching its 400th anniversary with a service next month, to commemorate a little-known but historically significant designation: "Their Majesties Chapell", which dates back to the year 1697. Evidence of the special royal title remained buried in archives for centuries, until a scholar brought it to the church’s attention. “The service has been set for March 18, because that’s the date on the warrant,” explained church rector Rev David Raths. “It is the earliest known instance of that term being used.” The warrant in question authorized the delivery of royal silver to St Peter’s, which the church still keeps in its safe. The document bearing the special term did not emerge until considerably later. The historian who uncovered the warrant, Thomas Sinsteden, has sailed to Bermuda several times over the years. Mr Sinsteden noticed the document among other warrants at the Public Records Office in Kew Gardens, London, and recognised it as a significant titling. Contacted in the US, Mr Sinsteden described the chance discovery as “typical of research. When one does research, one comes across these things. Mr Sinsteden spotted the document about ten years ago, during research on the Duke of Ormonde a major figure of the 17th century Anglo-Irish political stage, who was born the year after the arrival of the Sea Venture in Bermuda. Stopping off at the Island during the Newport-to-Bermuda yacht race, Mr Sinsteden said: “I had a bit of time on my hands. I went to St Peter’s Church and saw some Irish silver on display in the safe there. Among the silver was some royal silver.” He returned to the church with a copy of what is technically known as the Intituling Document: the order for the silver, sent to the “Master of His Magesties Jewell House”, which specified its use in “Their Majesties Chappell.” The warrant will not change the name of St Peter’s Church, but it adds another title and another distinguishing feature to what is already the oldest Anglican Church outside the British Isles. Mr Sinsteden brought his copy of the document to St Peter’s in 2007, just in time for church authorities to add it to this year’s happy coincidence of the Queen’s Diamond Jubilee and the 400th anniversary of St Peter’s. The historian said he looks forward to attending the ceremony in Bermuda. “He just walked in off the street and said he had something for us. I saw the Majesties Chappell and I thought, Oh, boy,” Rev Raths said. “That’s why the first thing in our service will be to have the warrant read it out publicly.” Actually confirming the Royal title for St Peter’s required some behind-the-scenes diplomacy. Rev Raths spoke with David Baldwin, a member of the Queen’s Household, whose official title is Sergeant of the Vestry of the Chapel Royal. “He was very excited to hear about it,” Rev Raths said. “We’ve had Royal visits before but we’ve never had a Sergeant of the Vestry.” Mr Baldwin’s own title extends back significantly farther, he added, to 1066. Mr Baldwin is to visit the Island to present Governor Sir Richard Gozney with the formal document redesignating St Peter’s as “Their Majesties Chappell”, which Sir Richard will then read at the March 18 service. Rev Raths said that was fitting because Sir Richard had to write to the Queen to request permission to restore the title to St Peter’s. Actually reading the Intituling will be one of Sir Richard’s last duties as Governor of Bermuda, as he prepares to step down this May. St Peter’s will also receive new emblemage, in the form of a Royal scarlet banding, to decorate the Rector’s belt and the church’s own flags and banners. “This church has always been more than a town church,” Rev Raths explained. 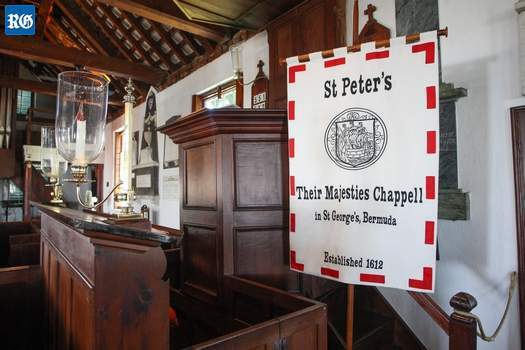 “We see it as an icon for Bermuda.” Grace Rawlins, chairwoman of the Intitulation Committee, said St Peter’s has been appropriately refurbished for the ceremony opening its 400th anniversary celebrations. “It’s going to be a challenge fitting everyone in here, Ms Rawlins added. “One of the most interesting points for me is the silver, which will be taken out and displayed on the altar table. I think that table could be the oldest piece of furniture in Bermuda.” The original document ordered the sending of two little flaggons, one challice, a petten and a receiver, to then Governor of Bermuda, Samuel Day. 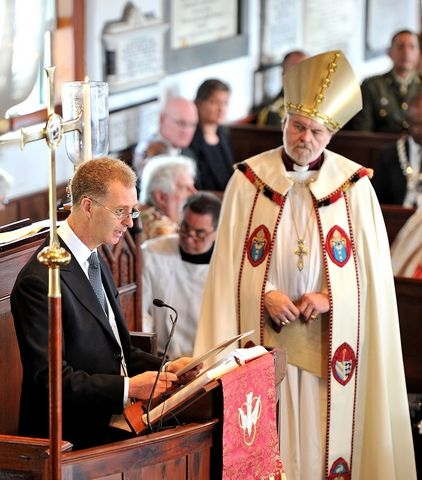 In November 2012, The Bishop of London, the Right Reverend Dr Richard Chartres, was on the Island to celebrate the 400th anniversary of the founding of St Peter’s Church. 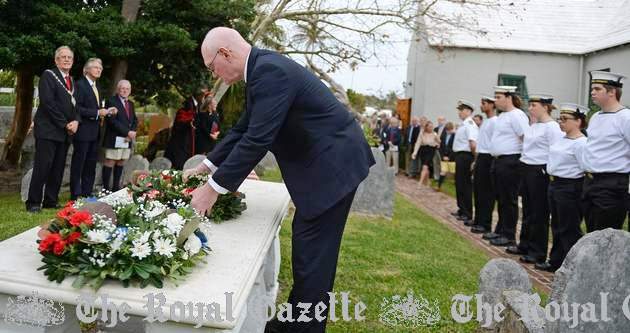 It was a ceremonial affair, attended by the Governor, Bermuda Regiment and clergy, with hundreds more watching. The church is possibly the oldest continually used Protestant church in the Western hemisphere, and believed to be the oldest surviving Anglican church outside of the British Isles. As Bishop of London, the Rt Rev Chartres is considered to be the third-highest ranking official within the Church of England. The visit was the Bishop’s first to the Island. While here he also hosted a lecture honoring Canon Thomas Nisbett for 50 years of service. The local (parish) Roman Catholic Church, built in 1947. 5 Queen Street. 5 Queen Street, St. George's GE 05, Bermuda. Or by airmail at P. O. Box GE 58, St. George's GE BX, Bermuda. Telephone (441) 297-8043. One of the largest early 18th century houses in the town. In the past three centuries, it has been owned or rented by some of the most prominent and influential families in Bermuda. It was already built when the land on which it stood was granted to Walter Mitchell in 1707. An active militia commander and officer in HM Independent Company, Mitchell was a third generation descendant of a family who migrated to Bermuda on the 'Plough' in 1612 and eventually settled in Southampton Parish. The house he built was one of the grandest of its day, a large two-floors hall and parlor house set right against the street, with two massive flanking chimneys and a steeply pitched gable roof. An even larger chimney was built on the end of the kitchen wing to the rear of the house and, over the centuries, no fewer than seven chimneys have been added to this building. Even the northern one floor extension at Stewart Hall has its own chimney. This may have been to accommodate a silversmith's workshop in about 1820. Mitchell married Sarah, the widow of Daniel Johnson, through whom he acquired a wharf and lot to the east of the Block House in St. George's. In the 1720s Mitchell was an active architect. He supervised the construction of the new Government House and built the Mitchell House, now the St. George's Historical Society Museum, for his nephew. By the time he died in 1731, Walter Mitchell owned several ships and possessed furnishings, trade goods and gold worth more than 4,000 pounds sterling, making him one of the richest men in Bermuda. Sarah Mitchell followed him to the grave two years later, and Stewart Hall was bequeathed to her daughter, Martha, the wife of Alexander Herron. The Herrons spent the 1730s living in the house before they moved to the colony of Georgia, where Alexander became Lieutenant Governor. In 1751 they sold Stewart Hall to George Tucker, the Colonial Secretary. George Tucker was a model citizen. He had inherited the posts of Colonial Secretary and Provost Marshall from his father, who had served in these offices in the 1720s. He was a member of the Govemor's Council under both Governors Popple. His house was a crowded one, since he had a wife, five children, and eleven slaves. The detached two-floor cottage to the north of the main house was probably home to some of Tucker's slaves, whose duties undoubtedly included looking after the small herd of livestock which Tucker kept in the yard. An archaeological excavation at Stewart Hall in 1990-91 revealed a livestock watering trough for these cattle, over a mid-17th century woman's grave, dug long before Stewart Hall was built. A probate inventory made after George Tucker died in 1766 reveals the wealth and refinement of the Secretary's home. He had created a cross chamber on the ground floor by dividing the larger hall with a partition, reflecting the Georgian predilection for symmetry and its emphasis on creating private spaces by increasing the number of doorways in a house. Tucker has a writing closet off the hall where he attended to his official duties. Silver plate, Chinese porcelain, English salt-glazed stoneware and lead crystal graced the Tuckers' dining room and exhibited their wealth and status. George Tucker's widow Mary lived in Stewart Hall until her death in 1787. The house was then rented to Andrew Durnford between 1789 and 1791 while he was improving the colony's fortifications and building Durnford. He lived in Stewart Hall with his mistress, Elizabeth Lucas, with whom he had six children. Hannah Stockton, who was George Tucker's niece, purchased the house at auction in 1795. She died there two years later and the house went to her two young children. The direct impact of the arrival of the British military in the 1790s can be seen in the fate of the Stockton's children. Her son became a purser in the Royal Navy and her daughter Sarah married Lieutenant James Robinson of the Royal Fusiliers. The Robinsons lived in Stewart Hall until 1819, when they departed for England and sold the house to silversmith John Trott Cox. He was responsible for the one-floor addition to the north of the house, which housed his workshop and retail store. Barrister (lawyer) Duncan Stewart purchased the property in 1849 and, although he never lived in the house himself, the name Stewart Hall, commemorates his ownership. 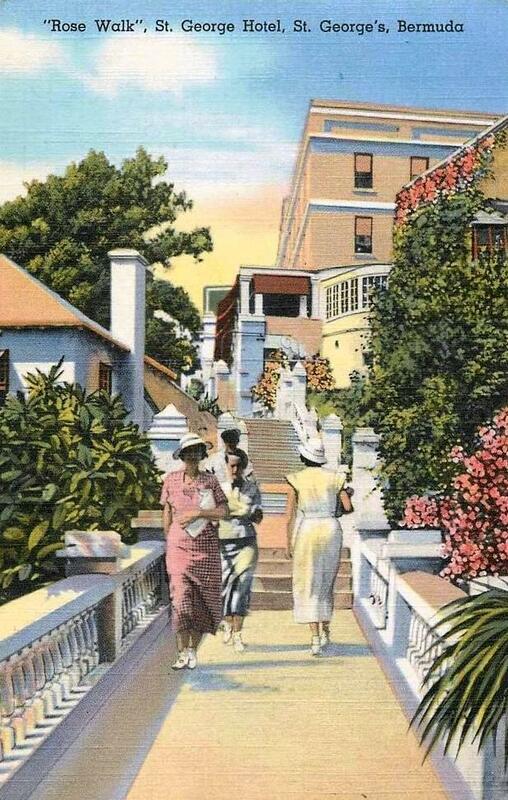 In the early 20th century, Stewart Hall was owned by the Higinbothom and Clifford families before the Bermuda Historical Monuments Trust purchased it in 1949. Until recently, it housed the St. Georges' branch library. It has since been acquired by The Bermuda National Trust. The latest tenant is the Bermuda Perfumery, now owned by The Brackstone Partnership. These are pleasant public gardens in the town, mostly open space, more of a park. They were opened in 1920 by the Prince of Wales at the time (later the Duke of Windsor), during his first visit (voyage) to Bermuda. Albert Edward, Prince of Wales (later, briefly, King Edward VIII) was then a serving Royal Navy officer on the 1920 refitted Royal Navy battle cruiser Renown, on a tour of Bermuda, the Caribbean, the USA and Australia. HMS Renown, lead ship of a class of two 26,500-ton battle cruisers, was built at Glasgow, Scotland. Completed in September 1916, she served with the Grand Fleet in the North Sea during the remaining two years of World War I. She was at HM Dockyard Bermuda during the Royal Visit. Bermuda cedar originals of these on King's Square were used from the early 17th century onwards, to mete out public humiliation and punishments. Today, they show how the punishment was inflicted. The stocks are like a guillotine's platform an offender has to climb up. Instead of a sharp and vicious blade coming down to sever the head at the neck, the head is held in the tight grip of two boards with apertures for the head and hands. In the old days, onlookers, sometimes crowds, often jeered, shouted rude messages and threw rotten fruit or worse at those being punished. It was also a time when disputes between neighbors could be settled with malice. It was extremely humiliating and could go on for hours. It was highly effective at making sure folks did not break the law or disturb the peace. In this photograph by author Keith A. Forbes, a couple from Maine, who deserved much punishment for not spending enough money in Bermuda but instead staying for free with local relatives, were locked securely in the stocks until they agreed to treat their relatives to a nice lunch at a local restaurant. Names reflect the whimsy or purpose at the time of the streets. As merely a few examples, Duke of York Street commemorates the Duke with that title when the street was created. British royalty still has a Duke of York. Featherbed Alley (bottom right) commemorates the fact that a local property shown could afford a featherbed, a mattress filled with goose or other feathers. It was at a time when most properties both in Bermuda and abroad could not. One Gun Alley is so called from when a gun platform protected the town during the American Revolution. Shinbone Alley commemorates British soldiers being so drunk from a grog shop once here that they went back to their barracks on their hands and knees. Somers Supermarket, 41 York Street, open 7 days a week, telephone 297 1177. (A branch of the Supermart in the the City of Hamilton. Limited selection). A bigger supermarket is on St. David's Island, also in the Parish. Named after a dockside area in Cardiff, Wales, United Kingdom, it is a western area of the town, near where ships and freighters dock and where there are loud concerts. A plaque here marks the World Heritage Site status conferred on the town, to make it one of the more than 630 such sites. 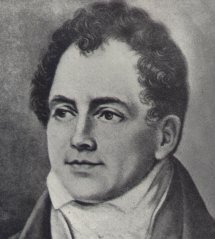 This town is connected with this British and Irish poet Tom Moore - in Ireland, considered a national poet and always referred to correctly as Thomas Moore, never as Tom Moore - who arrived here in 1804 aboard a Bermuda-built sloop after a stormy voyage, via Norfolk, Virginia, when he was 24 years old, before he became famous. He lived and worked as Registrar to the Court of the Vice Admiralty. The town was then still the capital of Bermuda. He described the harbor of the town and parish as the "sweetest miniature of nature that can be imagined." He was said to have become instantly enamored of Bermuda. “These little islands of Bermuda,” he wrote in a letter on January 19, 1804, “form certainly one of the prettiest and most romantic spots that I could ever have imagined, and the descriptions which represent it as like a place of fairy enchantment are very little beyond the truth. “From my window now as I write, I can see five or six different islands, the most distant not a mile from the others, and separated by the clearest, sweetest coloured sea you can conceive; for the water here is so singularly transparent, that, in coming in, we could see the rocks under the ship quite plainly. These little islands are thickly covered with cedar groves, through the vistas of which you catch a few pretty white houses, which my poetical short-sightedness always transforms into [ancient Greek] temples …" Hr wrote touchingly of Bermuda in other ways. He had already published many poems and ballads so had a certain reputation. He lived in rented premises on Old Maid's Lane, where there is a statue of him. Later, as a lusty bachelor hungry for female companionshp he became notorious as the author of love poems to "Nea" - the 17 year old wife of William Tucker, Marshal of the Court of the Vice Admiralty. But he stayed less than four months. Perhaps because his ardor cooled when his attentions to Nea were not reciprocated and he was not well-regarded by her husband and his friends, he came to believe that Bermuda and its remoteness were too tame. Later, he came to regret bitterly that he ever set foot in Bermuda. It was because the man who replaced him, or someone else in Bermuda, cheated the Admiralty but Moore was blamed and had to make good the losses. It aged him prematurely and affected his health. After he left Bermuda, he wrote splendid poetry later set to music, one of the most recognizable pieces being the "Last Rose of Summer." But his name lives on in Bermuda for the Tom Moore's Restaurant in Hamilton Parish named after him. The custom and tradition is now an entirely British one. It stretches back many years before this town was born in 1612. Recently, Bermuda's David Frith, Town Crier of St. George's, was awarded the top prize at an international Town Crier competition in England. As Lyme Regis is the twin town of St. George's, Mr. Frith is also the honorary Town Crier of Whitchurch Canonicorum, the village where Sir George Somers is buried. In in the European Town Crier Championship and other town crier competitions, Bermuda has historically done well. 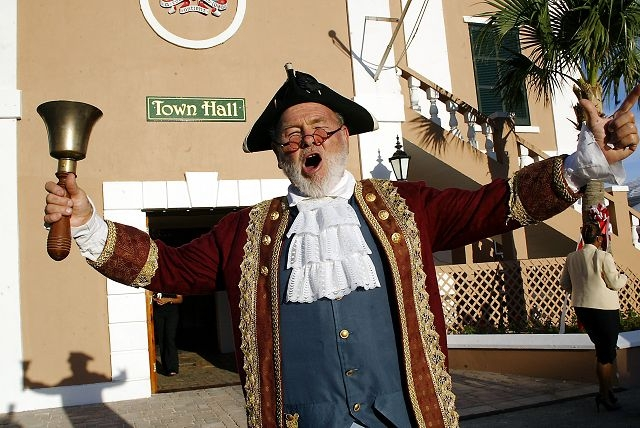 St. George's former Town Crier E. Michael Jones won the Armada Cup in 2000 and St. George's Town Crier in the mid-1980s, the late Major D. H. (Bob) Burns, MC, Town Crier of this town, held the Guinness World Record for the loudest human speaking voice. Tracing the position's roots back to ancient Greece, town criers were virtual "newscasters" of the day and usually the chief means of disseminating public news. Employed by a town council, criers were typically literate individuals who were able to read announcements, proclamations, local bylaws, advertisements to the townspeople, since many townspeople could not read or write. Notifying citizens by ringing a bell (or banging on a drum in France and Holland), criers in mediaeval Britain typically dressed elaborately and shouted "hear ye, hear ye" which signified attention and silence. In medieval Britain, criers were the nation's newscasters. Dispatches from foreign wars, by-laws, judicial rulings, important proclamations, even advertisements, were issued forth by men whose status was soon indicated by the fine livery they wore, and, the unique royal protection they enjoyed. The costume indicates his official status as an ancient town's watchman and reader of news. He also specified the punishments to be publicly administered to law breakers according to the traditions at that time. They included consignment to the stocks, being pilloried and whipped, ducking stool sessions, and execution. It was a part of the crier's job to deliver bad news such as tax rises, and the closing of bawdy houses, and to this day it remains an offence to "hinder or heckle" a town crier as he goes about his business. In the United Kingdom today, a valid, competition-grade cry must begin with the traditional "Oyez, oyez, oyez!" – thought to be a corruption of the French ecoutez (listen) – and end with the National Anthem. Most criers further preface their announcements with a peal on a hand bell, although horns, trumpets and even rattles are permitted. Criers strive to develop a distinct style of delivery. Town criers and their spouses from around the world have visited Bermuda and this town. Bermuda cedar furnishings including the old chairs and Mayor's "throne" and photographs of past mayors. No one will mind if you sit yourself in one of these easements and have your own photograph taken. Painting of St. George's Harbor in 1861 by noted British artist Edwin James, then a resident of the town. You'll note the ships, complete with their names, flying Confederate flags. Letters written to and by Her Majesty Queen Elizabeth II. In November 1998, a flagstone from Somer's actual home at Berne Manor, Dorset, was brought from England and is now laid permanently in the entranceway of the Town Hall - as a reminder of the unique bond between the two towns. When not in session, the town hall is open to the public by day. For over 100 years, it has been a controversial issue that town hall meetings have not been open to the public, unlike in all British -UK municipalities and most USA and Canadian ones. Behind the Town Hall are toilets for men and women, also with access for the disabled. Book: Tucker House. The Story of a House, its people and its contents. 2015. Diana Chudleigh, photographs by Ann Spurling. Bermuda National Trust. 68 pages. Water Street, St. George's. Telephone (441) 297 0545. Open Monday to Saturday 10 am to 4 pm. The stark exterior of this early 18th century merchant's house is a most interesting museum owned by the Bermuda National Trust. The house is said to be the most typical of early Bermudian house construction although the date of the building is unknown. Archaeological evidence suggests that it was standing, largely as it appears today, by the middle of the 18th century. 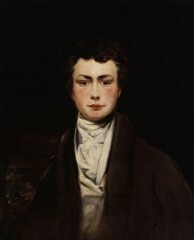 A known first owner was a Thomas Smith. See the architecturally elegant interior furnished with family heirlooms dating back to 1775, when the house was owned and occupied by the Hon. Henry Tucker, Colonial Treasurer and President of the Governor's Council (1775-1807) and his family from 1770 to 1808. The first Tucker to arrive on the Island was Daniel, who came out from Kent in 1616 to serve as the Colony’s second governor. It is believed that the Tuckers installed the large paneled doors with the decorative wood carvings, inspired by the Adams brothers, some time during the last quarter of the 18th century. Henry Tucker and his sons were involved in the infamous Bermuda Gunpowder Plot of 1775. They contributed richly to British, American and Bermudian history. Crystal chandeliers, an extensive collection of Tucker family silver, antique English mahogany and Bermudian cedar furniture and exquisite hand sewn quilts, are some of the treasures on view. A few of the lovely antiques include a superb Bermuda cedar tea table circa 1730-1740, along with a fine set of Bermuda cedar side chairs with caned seat (circa 1730). These and the tea table are thought to have once belonged to the original Tucker home, The Grove. In the drawing room are two important portraits of Colonel and Mrs. Tucker, nee Anne Butterfield, painted in 1753 by Joseph Blackburn, a visiting artist who was also well know in New England. Major Henry Tucker (1658-1726) stands over the fireplace. The bedroom has an English mahogany four-poster bed with rice pattern carving, on which lies a hand sewn quilt. There is a rare example of a Bermuda cedar three-sided cradle in the nursery along with side chairs made for children. Many items were donated by the American branch of the Tucker family, from Baltimore, Maryland, and Williamsburg, Virginia. Three pieces were made by cabinet makers Henry and Samuel Smith and their slaves Nokey and Augustus. As a team, they created superb examples of local furniture modified from English and American furniture. One of the portraits on display is that of His Excellency, Governor George James Bruere, Lieutenant Colonel in His Majesty's Service, at the who died on September 10, 1780 at the age of 59 years. Bruere was the British Governor and Commander-in-Chief of Bermuda from 1764, through the start of the American Revolution in 1776, until his death. He was outraged when, under his nose, Bermudians who sympathized with George Washington and his patriots including the owner of this house, stole a big cache of British Army gunpowder in Bermuda in 1775 and got it to the Americans. Bruere was outraged when he discovered what had happened and put up a reward for the capture of the Bermudians responsible but to no avail. 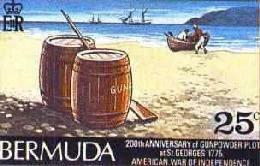 It became celebrated as the Bermuda Gunpowder Plot (see stamp, right). Because he died of fever he was buried under St. Peter's Church, St. George's. Bruere lost a son also in the army fighting the Americans in 1778. One of the rooms in the house, the Rainey Memorial Room, is dedicated to one Joseph Haynes Rainey, who spent the American Civil War years and until 1866 in Bermuda with his wife. Both had managed to escape from their earlier lives in the American South, where they had been slaves. 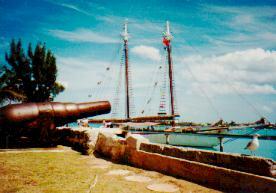 They sought and obtained refuge in Bermuda. As a barber and dressmaker respectively, they were treated with respect and made a good living. When they finally returned to their native Southern state in 1866, with slavery having been abolished there, Mr. Rainey was appointed - not elected - during the Reconstruction period as the first ever black member of the United States' House of Representatives. The late Bermuda historian Cyril Packwood wrote a book about him, Detour - Bermuda, Destination - US House of Representatives. The home was bequeathed to the Bermuda Historical Monuments Trust, predecessor of the Bermuda National Trust, by their great-grandson, Robert Tucker, when he died in 1950 at the age of 102. Underneath Tucker House, at street level, there is a book store called "The Book Cellar" with a complete range of books on the town. For further information, call (441) 297 0448 or fax (441) 297 4072. A long, colorful residential homestead road, a hill in parts, off the main artery of Queen Street, within the town. It is so-called because the road and area was once part of a 17th to 18th century farming district which used to grow lilies, potatoes, turkeys, ducks and chickens for export. In about 1620, the turkeys that originally came from the USA were the subject of many complaints for being wild. But in about 1762, about 30,000 turkeys were reputedly sold to the USA, which is when the road was titled. On Church Folly Lane. On 2nd December 2010 it was officially declared off limits due to an “imminent danger to the public” posed by crumbling masonry. 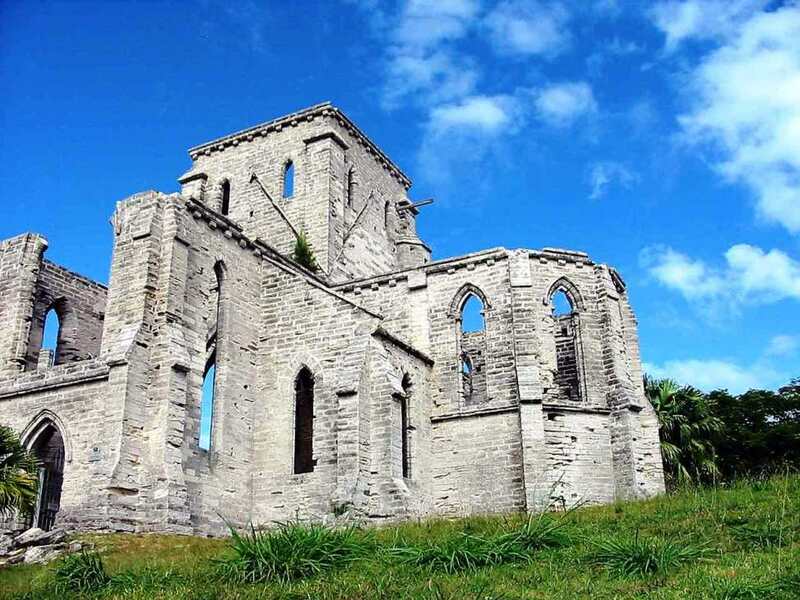 According to a Bermuda National Trust spokeswoman, a recent structural survey shows “substantial deterioration suffered in recent years by the venerable structure.” The popular site, rented and maintained by the Unfinished Church Refurbishment Company, was ordered shut after the group’s November 17 annual general meeting. The Company now plans to meet with the Trust, St. Peter’s Church Vestry and other interested parties “in hopes of securing the future of this iconic building.” The spokeswoman said although the Unfinished Church needed constant attention, the extent of recent deterioration was more than expected. “The survey showed weathering from water and wind posed a danger to the public from falling masonry, and the Trust had no choice but to close it.” The Church remains closed until repairs can be arranged. This towering structure on Government Hill Road was begun in 1874, on the site of the third Government House - dwelling of the Governor until 1815 and seat of local colonial power - which was demolished to make way for this church. Original architectural plans for this historic monument were by the famous Scottish firm of William Hay (who also designed the current Anglican Cathedral in the city of Hamilton and Government House in Pembroke Parish). It was intended as a replacement for St. Peter's Church, but was never completed. It was then believed that St. Peter's had deteriorated too much to be worth saving. But financial difficulties, followed by dissent within the Anglican community at the time, then finally severe damage to the rising structure by a storm, caused the project to be abandoned for good. Nevertheless, it is a magnificent gothic structure. In its death as an intended new church, it breathed life back into the old one when St. Peter's was restored. 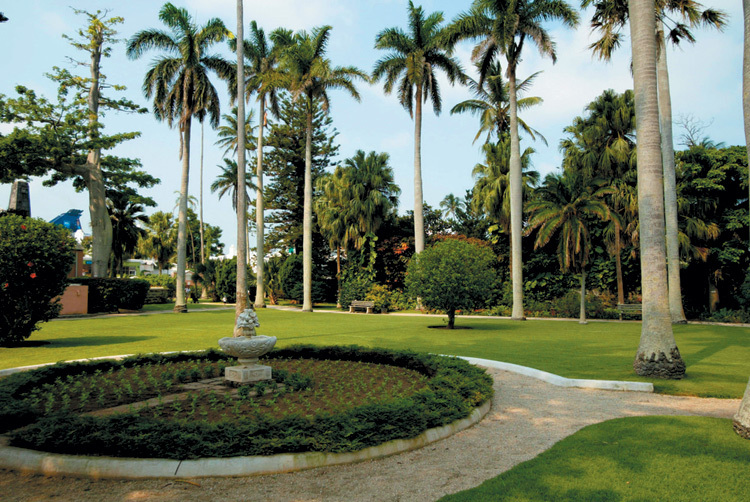 Today, it is one of the many properties of the Bermuda National Trust which is working to make it safe for public viewing and perhaps a site for cultural performances. Visitors can enjoy the views, but from a safe place. 2019. April 16. A new facility has opened on York Street. Phone (441) 297-0556. Cell: (441) 599-1239. Email stgeorgesvic@bermuda-tourism.com. 9 am to 4 pm Monday-Saturday. Closed Christmas Day, Boxing Day, New Year's Day, Good Friday. The facility gives visitors electronic information on the Olde Towne and across Bermuda, helps them book activities and sells Bermuda-branded products. It was set up as part of the Bermuda Tourism Authority’s plan to make information more readily available for tourists. Tourism minister Zane DeSilva said: “St George’s is one of the best places in Bermuda to spend the day wandering through the town, shopping at locally owned businesses, visiting the beach, and mingling with the locals. One of the biggest challenges that has faced the Town of St George’s is how to share the wealth of information and activities in and about the Olde Towne with our visitors. We needed a location with the necessary technology and features, while maintaining the Olde Towne’s architectural charm. We needed a location that was more aligned with our younger, fresher Bermuda brand. Our visitors now have a central location in the heart of St George’s to learn about the history of St George’s and to plan and book their personalised Bermuda experience. The new VSC will encourage visitor spending and enhance awareness of the incredible experiences available in the East End and across Bermuda. It provides a place where our visitors can discover all that is on offer and make purchases or reservations with the touch of a button.” Mr DeSilva said visitor satisfaction levels had improved since the opening of the Dockyard Visitor Services Centre. One of the town's principal streets, so-called because on the south side stores and other properties overlook St. George's Harbour. The street ends/begins at King's Square. There were many in the town, with a number of executions. The Corporation of St. George will have a town record of them. 12 Clarence Street. St. George's. Historically important, a 2 storey mansion house built and designed himself by St. George's Mayor John Van Norden in 1815 as his residence. He also supervised its construction. Many elite social functions were once held here. It later became residence of several other Mayors of the town. With a slanted hipped roof, quoins at the corners of the walls, moulding around the windows, eaves and double verandas. One veranda was added later by the Mayor B.F. James. There is a wooden porch at the western side. The gateposts are attractive. The splendid staircase has two welcoming arms. Now a private residence. A $6 million project officially opened in its entirety by Governor Sir Richard Gozney on July 28, 2009 for the Somers Day public holiday, previously opened in stages. A museum and exhibit centre with a small shop on the ground floor and a Visitor's Service Bureau. It was begun in 2004 as a project to restore the 1860-built Queen’s Warehouse at Penno’s Wharf. Installed were a movie theatre; air conditioning; a bathroom, staircase, windows, doors, with flooring and roof repaired. It is an important education and tourism product; creates life and activity in the Penno’s Wharf area; and became a teaching resource for Bermuda’s students and visitors who can view Bermuda’s history through film and interpretative exhibits, and then explore the Town. The Bank of Bermuda Foundation was the single largest donor to the Centre. Visitors and residents alike can learn more about the history that has shaped Bermuda over the past 400 years. Guests take a walk-through tour of displays charting Bermuda’s history from the pre-settled era the ending of slavery in the 1800s. There is a life-size recreation of the deck of the Sea Venture as she floundered in the storm that brought the first settlers to the Island, and another exhibit features a model whale’s tail and a Bermudian fisherman poised with a harpoon. Amongst the static displays is a life-size giant turtle, a few cahows looking down from rocky perches and a miniature model of how St. George’s is thought to have looked in 1620. Children and the young at heart are able to dress up in period costumes from bygone days in a special activity corner of the Orientation Exhibits Gallery. On the walls of the gallery are displays charting the events that shaped Bermuda’s evolution from an uninhabited paradise to a prosperous and remote colony. Bermudian actors recorded the audio soundtracks played in some parts of the gallery. The exhibition is part of the St. George’s Foundation’s work.